This beach is truly off the beaten path. 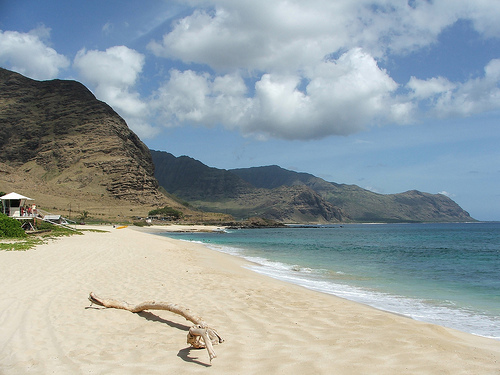 You need a car to get here as the City Bus only goes up to Makaha Beach. Yokohama Bay is about an hour drive from Honolulu. It is one of the most remote beaches on the island and never crowded. 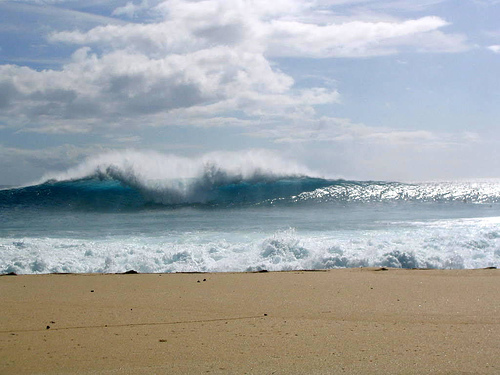 In the winter months the beach gets pounded by high surf. This is the time when many local surfers come here to experience some thrills in the churning white water. Lifeguards are present most of the time and for good reason. The rocky sea bottom, strong currents and high waves are dangerous especially for beginning surfers. Yokohama Bay OCEAN INFORMATION — For a detailed description of the Pacific Ocean’s marine climate, water properties, currents, tides, waves, etc., please visit The Ocean Atlas of Hawaii online. You’ll learn many interesting facts, like our average surface water temperature in Winter is 75 F (24 C) and 81 F (27 C)in the Summer.Call 596-SURF (that’s 596-7873) to hear a recorded message on conditions at various O`ahu beaches. The recording is a free service of the Surf News Network (SNN) and is updated four times a day, 365 days a year, at 7 a.m., noon, 3 p.m. and 7 p.m. In addition to wave heights, SNN provides information on winds, tides, and buoy readings.